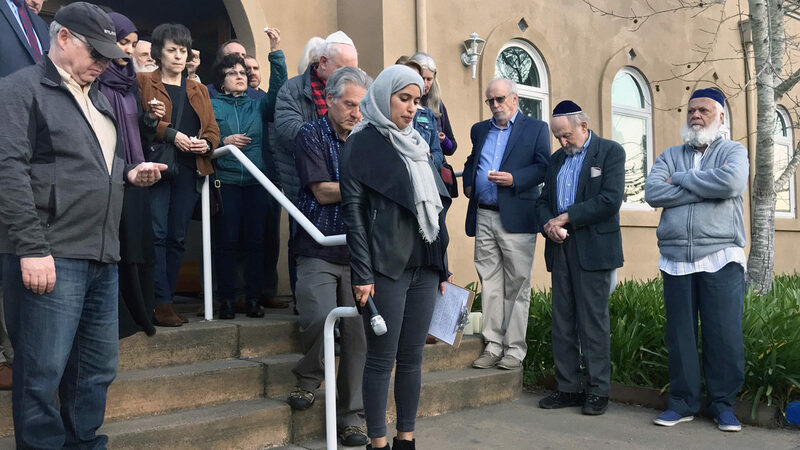 Jews visit Oakland mosque to show support, ‘love the stranger’ – J. The rain was beginning to fall, but the crowd of about 30 people assembled outside the Islamic Cultural Center of Northern California in Oakland last Friday was undaunted, donning head coverings and clutching signs as they awaited the start of prayers. Few had been to prayers at a mosque before. But the spirit of joining in was palpable. “It gives me the opportunity to learn,” said Karen Paull, who organized the trip for Jewish Gateways, a Berkeley-based nonprofit that connects Jews, many unaffiliated, through study and worship opportunities. It was in that same spirit that the Islamic Center received its guests, ready to come and find common ground. “I think if we stick together we won’t get pushed around,” said Payman Amiri, board chairman of the center. Paull said the idea to visit for Friday prayers came out of a suggestion by Shoulder-to-Shoulder, an interfaith organization dedicated to ending anti-Muslim sentiment. The crowd came to show friendship and solidarity, especially in light of the recent executive order by President Donald Trump banning travel from seven Muslim-majority countries. “It makes us want to reach out to our neighbors,” said Rev. Christian Schmidt of the Unitarian Universalist Church of Berkeley, who attended with a half-dozen of his congregants. 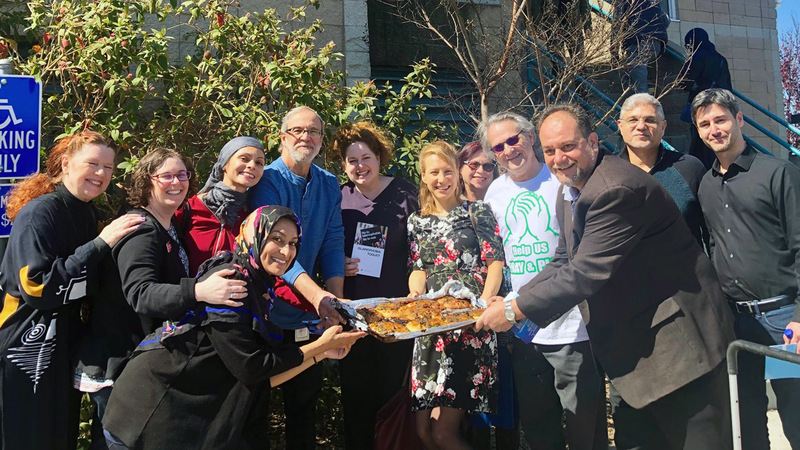 For Rabbi Bridget Wynne, executive director of Jewish Gateways, the visit was a concrete manifestation of the “love the stranger” teaching in the Torah. “This is a way to continue the work of connecting to people different from us and seeing them as people,” she said. In the same spirit, the Muslim men and women who come regularly to Friday prayers were gracious hosts. The center aims to celebrate Islam through art, education and culture. Hashim Ali, a U.C. 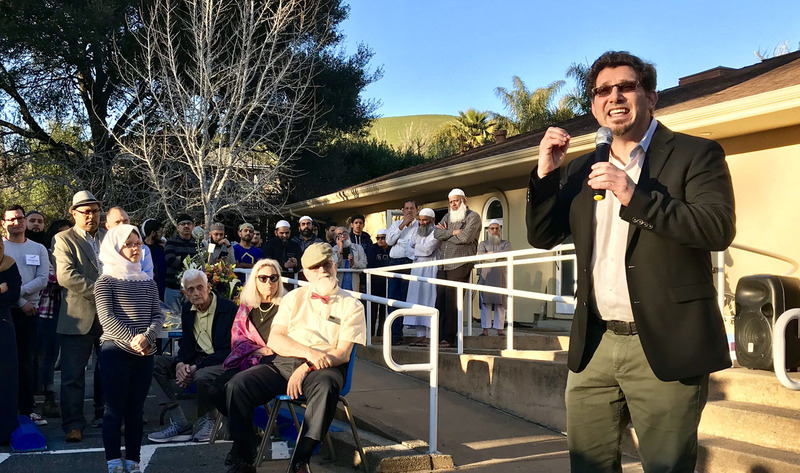 Berkeley Ph.D. candidate who leads services twice a month, touched on the commonalities among Judaism, Islam and Christianity during the before-prayer sermon known as a khutba. “The thing that we have in common is one God,” he said. The guests were fed a halal chicken lunch before forming a circle to discuss the current political climate and the values of compassion. Attendees took turns introducing themselves, sharing their reasons for coming and telling stories of persecution their own ancestors experienced. In fact, Friday’s visit was not the first positive gesture the Islamic Cultural Center has received since the election of Donald Trump. The thing that we have in common is one God. Founded 21 years ago by a group of Iranian immigrants studying at U.C. 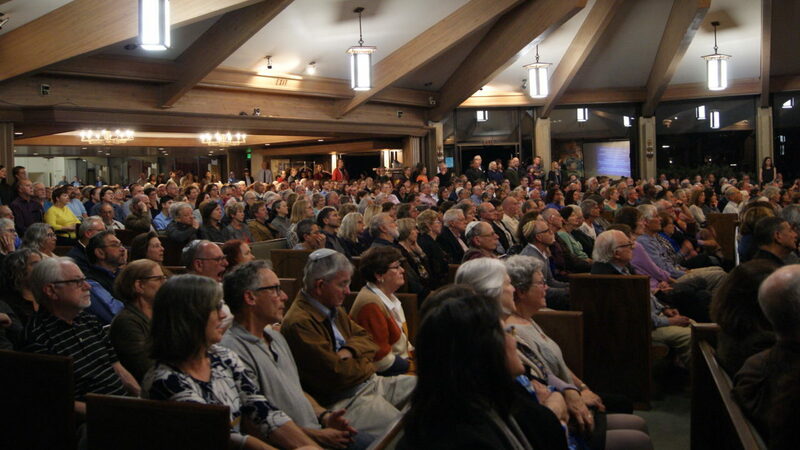 Berkeley, the center has long been keen on building connections with local congregations. It also runs a school that teaches the Farsi language and Islamic ethics, hosts an interfaith art exhibit biennial, and is part of a “Faith Trio” with Kehilla Community Synagogue and Montclair Presbyterian Church. “This is a unique place because it’s not all about serving Muslims,” Amiri said. The center was featured in a recent San Francisco Chronicle article about its efforts to distribute 1,000 sleeping bags to homeless people in Oakland and San Jose. Amiri hopes to extend the network of like-minded people from other faiths to tackle ambitious social justice projects. “We should work together not just during crises,” he said. But for the Jews who visited the mosque, it was the current political environment that spurred them to reach out. “The cause is probably pretty obvious,” Wynne said. 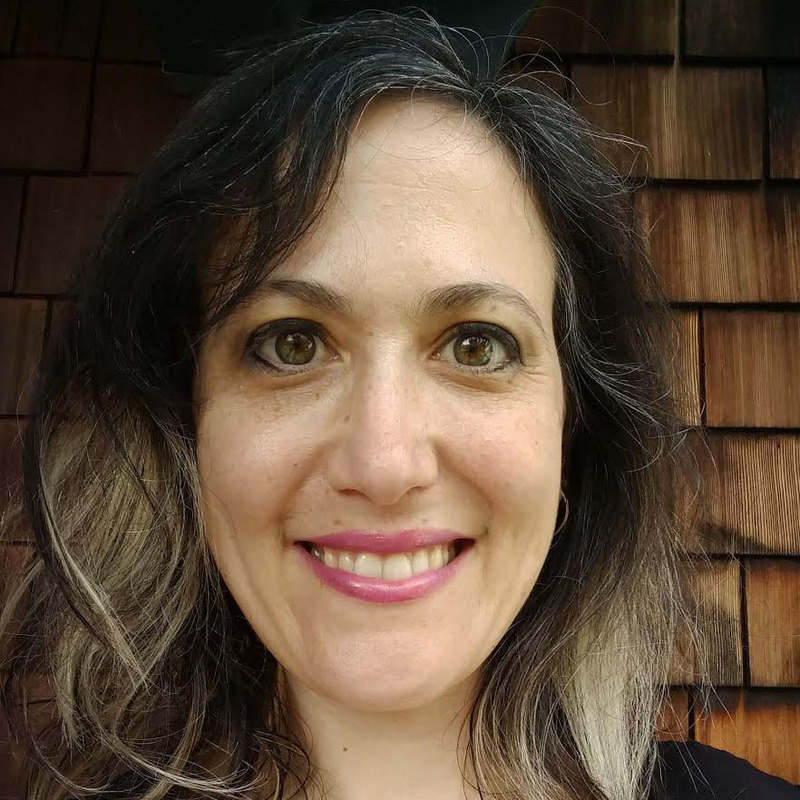 Kehilla’s Lea Delson, who works on the interfaith art exhibit and was at last week’s gathering, had heard about an uptick in interfaith endeavors around the Bay Area in the past few days. “There is so much desire to show solidarity,” she said. 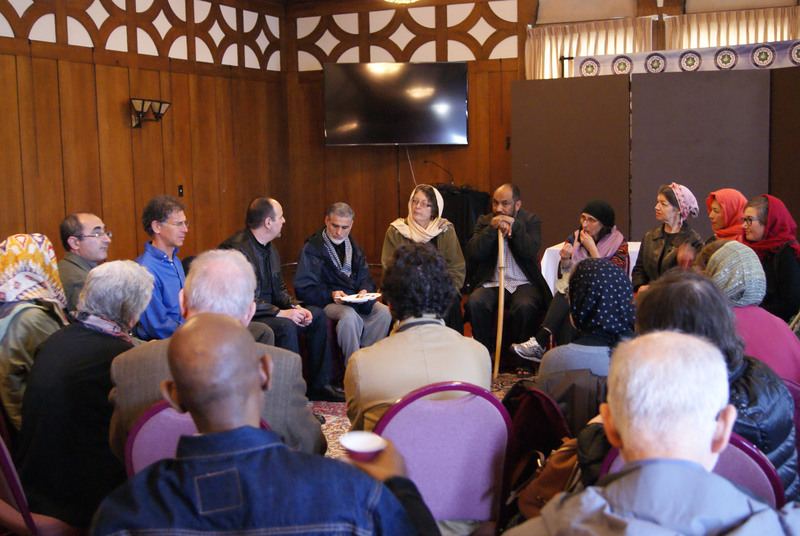 It may have been the first time some of the Jewish Gateway participants were inside a Muslim house of worship, but for many it was only a first step. “Action is a great antidote to being disheartened,” Wynne said.